CopyTrans Contacts sees my contacts in double or triple. Why? Home » CopyTrans Contacts sees my contacts in double or triple. Why? CopyTrans lists iPhone contacts sourced from multiple locations and accounts. Such locations include local iPhone memory, as well as contacts sourced from iCloud, Exchange, Gmail and Yahoo. For example, you have a contact entry saved in both the local phone memory and your iCloud account, CopyTrans Contacts will list both entries next to each other. These entries are not duplicates but simply exist in more than one account. 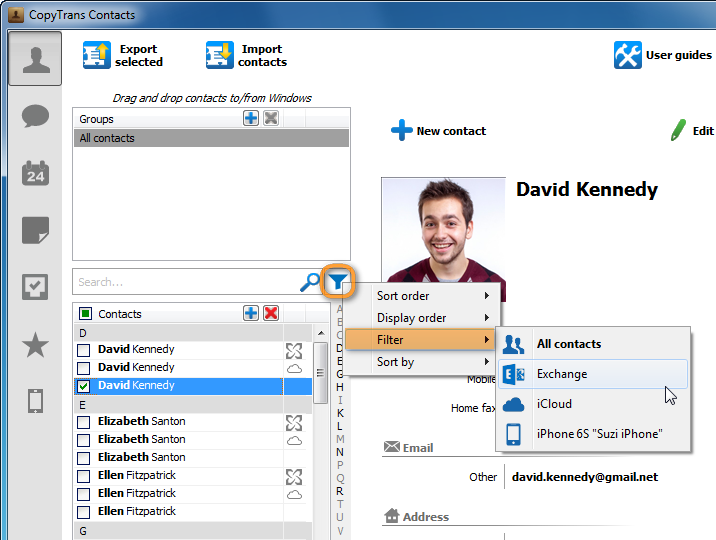 The above screenshot shows the same contact is listed three times in CopyTrans Contacts which means it exists in three locations. For instance, contacts marked with a gray star are sourced from Exchange. Contacts marked with a cloud icon are sourced from iCloud. Contacts that appear without an icon to the right are those saved locally on your iPhone. And so forth.